The nature of modern housing often means that all the interior doors will look the same, the exception door being the one with a piece of paper taped to it, stating 'no adults are allowed in'. In this regard, children have the right idea. Door signs can be a light-hearted way of personalising rooms from the outside. It is also a good way of avoiding confusion when guests ask to use your restroom; no matter how clearly you say: "Upstairs, along the corridor and down the end on your right." People will inevitably get confused and start stumbling into bedrooms and walk--in cupboards, but they can't go wrong with the help of signage. 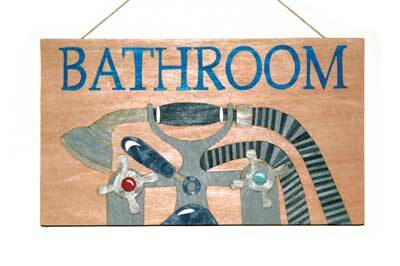 This marquetry sign is a fun way of making your bathroom stand out. 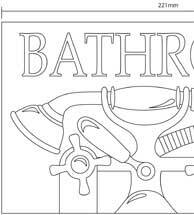 You could also look at personalising my design by replacing the taps imagery with an item of your own. Marquetry is only suitable for outside of the bathroom as the moisture content inside the room would force the veneers to expand and contract, ultimately causing them to peel away from the groundwork. Details of the 'window method' cutting technique used in this project can be found on pages 65-69 in issue No.80 of Woodworking Plans & Projects magazine. 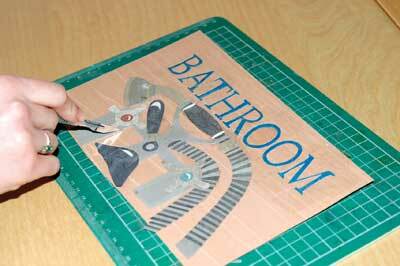 To cut out the lettering, use two paper templates with the letters already cut out, at intervals of every other letter. 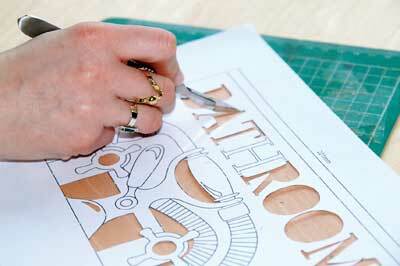 Placing your paper templates over the background veneer and securing, use the scalpel to cut out a letter. 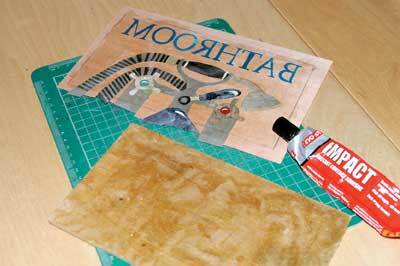 Then, place the foreground veneer underneath the background veneer to cut out any missing shapes. These two pieces should then slot together with a tight fit. Continue along to do all of the letters. If any have inner shapes, then use the waste veneer to repeat the process for these. For the taps design, the foreground will be cut first and the background fitted around it. This is because the layering of the design will get very complicated. Next, using the same technique of layering as previously - the templates over the veneers and adding veneers underneath - start with the very front of the image, at the taps and switch. 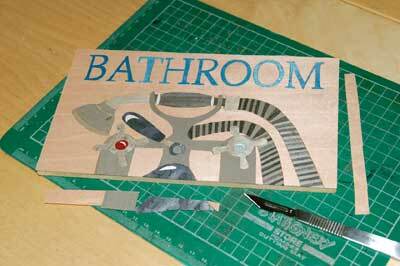 You can then begin to work your way back to the shower nozzle and frame work. Once the image is in one piece, it is a good idea to secure the marquetry with small pieces of veneer tape on the back. This can then be laid over the background veneer and cut around so that this will also slot together tightly. 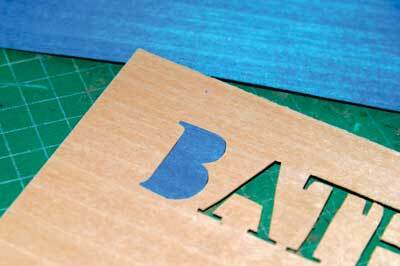 Accurately mark out the size of the template onto your chosen groundwork, then cut it out using a bandsaw. Smooth off any rough edges with sandpaper. Contact adhesive is not a traditional adhesive to be used in marquetry, however, it holds the veneers flat and dries almost instantaneously. As the sign is adhered together as a solid piece, there is no need for a long glue opening time. 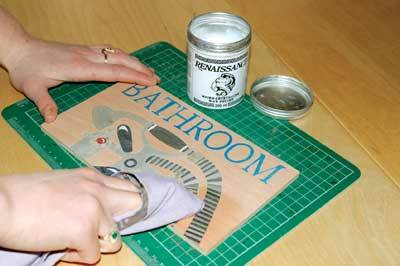 You can now apply the contact adhesive to the groundwork and the back of the marquetry. It is important to wait until the glue is tacky before you proceed. 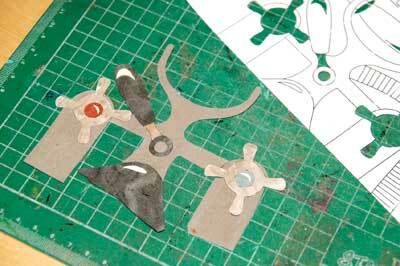 Press them together and squeeze any excess glue or air pockets out from between the two layers using a veneer hammer. 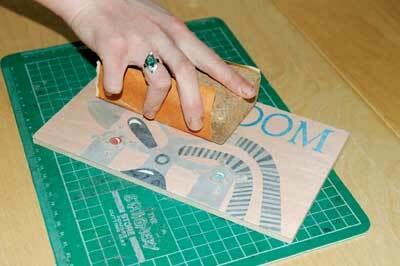 If desired, the marquetry can then be clamped flat as an extra precaution. Once the marquetry is dry, cut away any excess veneer with a scalpel. Remember, using glue will add moisture to one face on a piece of timber; this will make your groundwork bow so it is a good idea to add a waste veneer to the back of the sign. The grain of this veneer needs to be running in the opposite direction to the majority of your marquetry as a counterbalance. When the marquetry is complete, it is more than likely the surface will feel rough due to the veneers not being exactly the same thickness. 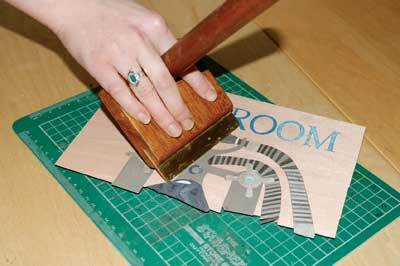 Use a sharp cabinet scraper and sandpaper to gently smooth out the surface. 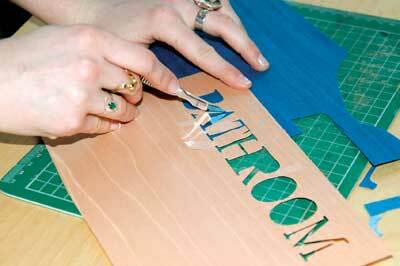 Be careful not to be too rough with the marquetry or the veneers may become chipped or damaged. Remember to always go with the grain when sanding. Although a variety of finishes could be applied to the marquetry, wax gives a very soft sheen that brings out the colours of the veneers nicely. Unlike most waxes, Renaissance wax will not leave a sticky residue afterwards. Once the surface is smooth and wiped down of sawdust, apply a generous layer of Renaissance wax using a piece of cloth. Make sure the fabric does not catch on the veneers and damage the design. Leave the wax to harden - you can tell if it has hardened because rubbing your finger against it would make a squeaking noise - and then buff with a piece of clean cloth. Once the sign is complete, you can add a fixing of your choice, making sure not to pierce through the front of the sign. 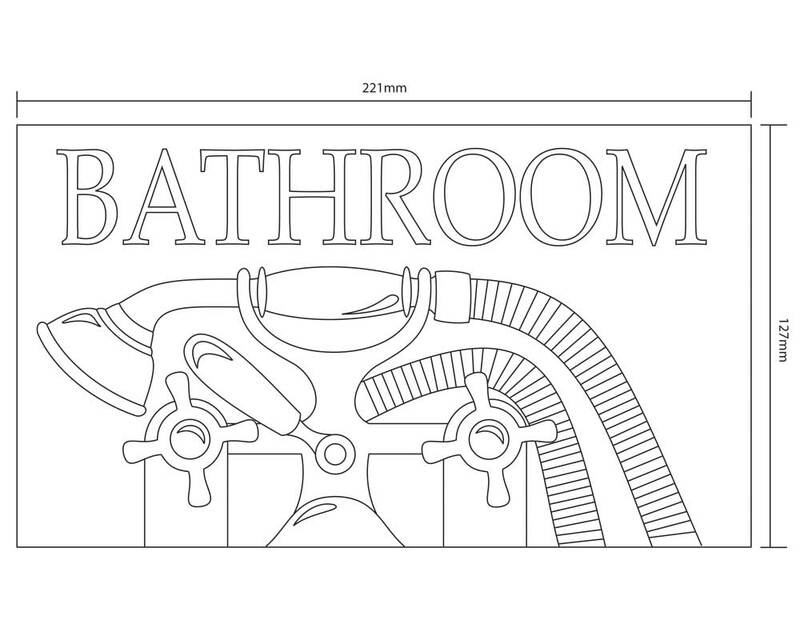 Your bathroom sign is now complete. 1. Consider the grain direction: the marquetry will look much more interesting if the veneers do not all follow the same grain direction. It is also easiest to cut if the grain runs down the longest length of the design section. 2. 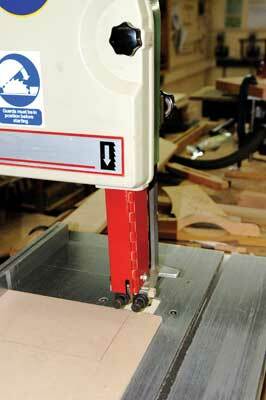 Rather than cutting the veneers straight, angling the blade will ensure a particularly tight fit to the design. Think about how the marquetry slots together: one veneer will need to have a protruding angle while the other needs to be the opposite. 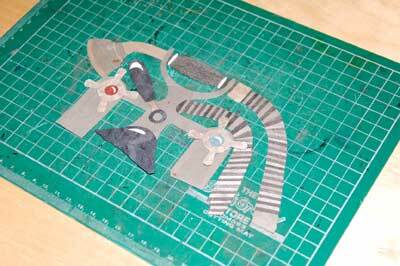 The window method used in this project for cutting the veneers, involves a scalpel. It is important to always cut at an angle away from yourself to avoid the blade slipping and causing a nasty accident! When gluing up the marquetry, contact adhesive gives off incredibly strong fumes so always work in a well-ventilated area.